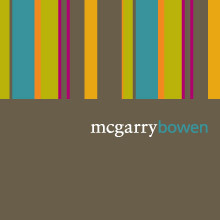 I chose the identity system for an advertising agency I’m interested in called McGarry Bowen. They are located in the city and have a very modern feel to their company, as you can see by the logo. They carry this theme onto their business cards, office space, website, and more. The colors are vibrant, especially against the dark brown/ gray. The font is elegant and simple and uses two kinds of type face with seriff and san seriff. This creates a hip yet old fashion feel. The vertical lines work with with the text being horizontal. The lines also are different kinds of thickness which adds interest. The logo matches the company perfectly, as it is stylish, chic, and now.